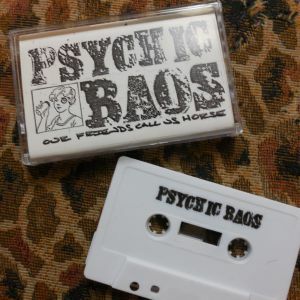 PSYCHIC BAOS return in 2014 with a brand new cassette EP, again on Magnetic South Recordings in Indiana. Our Friends Call Us Horse comes limited to 100 tapes, continuing their run of delirious and sloppy garage-punk. Based in Knoxville, TN, these songs are fronted by a belligerent-sounding Will Johnson. The tape comes with a slew of sounds and styles, all mixed into a grainy swirl spanning from garage rock, to punk, to dirgy blues burner. The EP opens with a surf-inflected punch in “Stampede Into My Mind,” which is a fitting title for such an invigorating introduction. Cavernous vocals echo from the depths below, driven by the furiously stomping guitar fuzz on top. Things change quickly with the sparse guitar twangs in “New Song #1,” sounding both stressed and striped down. Primal drum thuds lead the way over the scuzz, complemented by Johnson’s reverb-soaked howl. “$100 Blues” shows off a different side of the band. Rugged guitars suddenly come with a blues-flavored strum, unraveling rather slowly with a calming, cymbal-led rhythm. The result is a strung-out blues burner, one that will keep you swaying from start to finish. Last time we covered a Psychic Baos cassette it was long sold out, so we got to this one early for your gripping pleasure. Go snag one from Magnetic South right now! BUY the cassette from Magnetic South Recordings – limited to 100 tapes ! 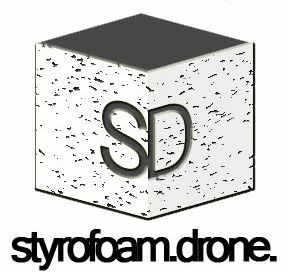 Posted on March 13, 2014 by styrofoamdronePosted in Cassettes, EP, ReviewsTagged experimental, garage rock, Lo-Fi, Magnetic South Recordings, Our Friends Call Us Horse, post-punk, Psychic Baos.